with “Chopin Festival” along with an exhibition organized by Mieczysław Tomaszewski.The festival was accompanied by a concert given by Stanisław Szpinalski, Irena Jęsiakówna and the Pomerania Symphony Orchestra under the direction of Arnold Rezler. During that time Fryderyk Chopin Memorial Room was created under the patronage of the workers of the sugar factory in Ostrowite. On 7 September 1952 the ceremony of unveiling of the memorial plaque and naming the school in Szafarnia after Fryderyk Chopin took place. The Fryderyk Chopin Memorial Room was renamed the Centre of the Cult of Fryderyk Chopin. At that time The Center’s seat was not impressive as it used to take up just two rooms in the school building. In the years 1957-77, the Centre was known as Fryderyk Chopin Music Salon. The most important problem behind organizing concerts was the lack of the grand piano. The first instrument was bought in 1977. Meanwhile the Salon got hold of a number of recordings of F. Chopin’s music as well as a stereophonic record player. While the Center’s name was subject to a number of changes, its main activity remained the same and focused mainly on organizing concerts and vernissages. In the period between 1970 – 76 due to the lack of the interest from the local authorities, the Centre was in such a dilapidating state that its activities had to be suspended. In 1979 there was a fire at the Dziewanowskis estate and as a result the Center was closed. Many of the exhibits donated by the Fryderyk Chopin Society in Warsaw were destroyed in the fire. In the period between 1980 – 1988, the Centre’s building undergone a complex repair. After the renovation which lasted 8 years, on 10 September in the presence of the local authorities, an official opening of The F. Chopin Cultural Centre took place ; the opening ceremony was accompanied by a recital by Ewa Pobłocka and also by the reading of Szafarnia Courier by Igor Śmiałowski. The Centre obtained some new pieces of equipment, a Petrof grand piano among other things. At that time the Centre occupied four rooms at the ground floor of the building (a concert room, a museum room, a lounge and a hall). The first floor of the building belonged to the primary School in Szafarnia. The park surrounding the building was also being developed gradually. The first person to become the director of the newly-refurbished building was Hanna Kończalska. The Centre’s most important preoccupation was organizing concerts of Polish as well as foreign artists (mainly piano recitals). In 1990 Elżbieta Buler became the new director of the place. She continued her work up till October 2008. During that time she initiated many projects which are still present in the calendar of events organized by the Chopin Centre in Szafarnia. The most important of the aforementioned events is The Fryderyk Chopin International Piano Competition for children and youth. The first competition took place in 1992. 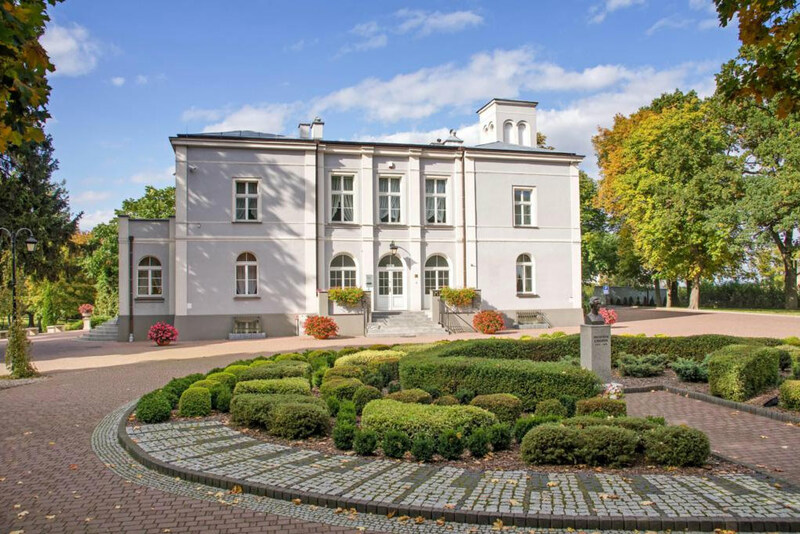 In the period between 2002 – 2003 there was a strike in Szfarnia organized by the parents of the children who attended the school which took up the first floor of the Dziewanowskis estate. The parents opposed to the decision of Radomin Commune Council concerning the closing of the school. During that time, the Centre’s activity was suspended for the second time. In February 2004, Sejmik of the Kujawsko-Pomorskie Voivodeship adopted a resolution regarding cooperation with Radomin Commune in the running of the New Chopin Centre, commencing on 1 September 2004. This institution took over all the remaining rooms occupied by the Primary School which had been closed. On 5 January2009, dr Agnieszka Brzezińska became the new director of the Centre. Some of her main aims are promoting the place among Polish and foreign tourists, broadening the offer aimed at children and youth and also transforming the museum room into an interactive gallery. Apart from the aforementioned plans, the Centre maintains its concert and educational activity on a regular basis. At the moment the Centre is preparing for the Chopin Year 2010 celebrations. Among its numerous investments, the Centre is the purchase of a new grand piano for which the Chopin Centre has already collected the money from the Ministry. Among the picturesque fields of Dobrzyń Land, in the vicinity of the ice-marginal valley of the RiverDrwęca and Chełmińskie Lakeland Szafarnia is situated. The name of the village has probably existed since the end of XIII century. However in written records the name appeared no sooner than in the Prussian land register of 1772 – 1773, which was created after the first partition of Poland. Szafarnia was made famous by the Dziewanowski family, using the Jastrzębiec coat-of-arms , which has owned acres in Rypin county since the second half of the XVII century. Members of this family were brought up in the spirit of tradition and patriotism and because of this they have always been remembered for their bravery in the fight for freedom. The most notable characters were those of Dominik Dziewanowski(1759-1827) and Jan Nepomucen Dziewanowski (1782-1808). The most important event in the history of Szafarnia, which contributed to its popularity on the Europe’s cultural scene, was the time when Fryderyk Chopin (1810-1849), the great Polish composer and pianist, stayed at the Dziewanowskis place. The beginnings of the lasting friendship between the Dziewanowski and Chopin families date back to the years when Mikołaj (Fryderyk’s father), then a bachelor, is said to have worked as a tutor and a teacher in Szafarnia. This friendship grew deeper because Dominik Dziewanowski (Juliusz’s son) and Fryderyk Chopin became friends and also due to the fact that Jan Nepomucen Dziewanowski became Ludwika Chopin’s godfather. The bond between Domuś and Frycek became even stronger during the period when the two studied together in the High School in Warsaw. This led to the two visits the young composer paid at the Dziewanowskis estate in the summers of 1824 and 1825. However, his stay was not only limited to social meetings and events. It proved to have had a great influence on the formation of artistic sensitivity in the author of piano masterpieces. It was nowhere else but in Szafarnia, where Chopin came in contact with authentic folk music, the elements of which can be found in his numerous works. His unique national style can also be attributed to this experience. What is more, many scientists claim that the mazurkas which were inspired by folk music, and which were played during young Chopin’s stay at the Dziewanowskis manor, became the models for the composer’s later masterpieces. It is assumed that during that time the original version of Mazurka a minor op.17, No. 4 called The Jew was written. Details of the young composer’s stay in Szafarnia can be easily reconstructed thanks to the letters he sent to his parents in Warsaw. The messages sent in the so called Szafarnia Courier, which bore a great resemblance to Warsaw Courier, present a substantial value. These used to describe national events (concerning Szafarnia itself) as well as the international ones (regarding neighbouring villages) in a very witty and amusing way. The aforementioned documents not only prove that the young composer actually stayed in the area, but also show us his character and temper. These documents portray him as a teenage boy whose interests focused not only on music and culture of the region, but also on the local society, its female part in particular. The visits of the great composer made Szfarnia an important place on the music scene. His stay at Dobrzyń Land initiated a number of cultural activities the aim of which is to propagate and popularize the music of this excellent Polish composer. Szafarnia has always encouraged numbers of people to come and visit this beautiful part of Dobrzyń Land. In the place of the former Dziewanowskis larch manor, there is an eclectic building, dating back to the end of the XIX century, which is the house of the Chopin Centre – a place of numerous cultural events. It is surrounded by a marvelous park in which one can wander among the trees which have been growing there since the times of young Chopin’s visits. ( Among park’s nature monuments there are some which are particularly interesting, namely Chopin’s lime tree and Dziewanowski Oaks. Fryderyk Chopin (1810-1849), great Polish composer and pianist. During his lifetime he visited Szafarnia twice while on summer holidays at the Dziewanowskis family estate. These experiences are said to have influenced his work and artistic imagination to a great extent. Dominik Dziewanowski (1759 – 1827) was an adjutant in the army of S. Poniatowski . In 1806 he entered the military service. He received The Honorable Legia and Cavalier Cross of Polish military order. Jan Nepomucen Dziewanowski (1782-1808), a well-known officer of the light cavalry who died after the charge on Somosierra. There is an obelisk in memory of this war hero at the cemetery near a church in Płonne. Before his death he was given a medal by Napoleon himself. Dzianisz P., Kurier Szafarski; Wakacyjna gazeta Fryderyka Chopina z sierpnia- września 1824 r, Bernardinum, Pelplin 1999. Chruściński K.; Chopin w Szafarni i okolicach – vademecum turystyczne, Turpress, Toruń 1995. Chruściński K., Szafarni moje uszanowanie; Fryderyk Chopin na Ziemi Dobrzyńskiej, Verbum, Rypin 2004. Juarez M. A., Sławińska- Dahlig E., Polska Chopina, Przewodnik po miejscach związanych z pobytem kompozytora; NIFC, Warszawa 2007. Kowalski R., Gmina Radomin; Zarys dziejów i walory turystyczno karajoznawcze; PRW, Toruń 2004. Wierzbicki P., Chopin – portret muzyczny, Krajowa Agencja Wydawnicza, Warszawa 1999.